Looking for something to do? 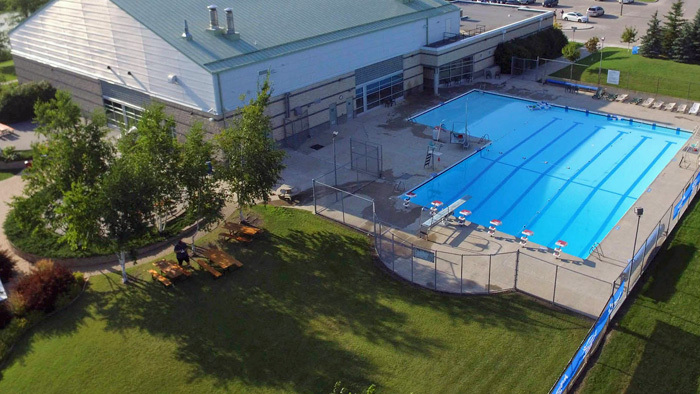 Steinbach’s family-friendly Aquatic Centre offers year-round swimming pool services, programs and activities for Steinbach residents and visitors to the area. The Steinbach Aquatic Centre offers over 24,000 sq ft of fun, including a Junior Olympic pool (six lanes), two water slides, one meter diving board, leisure pool, lazy river, sprays, children’s water play area, sauna, hot tub and multi-purpose room. The brightly lit and beautifully muraled Aquatic Centre has a spacious lobby, and includes accessible single and family changing rooms, bathrooms, showers and coin-lockers. Concession machines are available for snacks and beverages. The Steinbach Aquatic Centre offers special family rates, annual memberships, swimming lessons, group rentals, lap swims, aquacise swimming classes and birthday party rentals. Pre-purchase individual swim admissions for the Steinbach Aquatic Centre online! Admissions are refundable (less convenience fee) or exchangeable up until the start of your swim time. This brightly lit and beautifully muraled facility offers over 24,000 square feet of fun.